Having a nice picture is not only enjoyable, it also provides a permanent record of a dog's good looks for future reference. 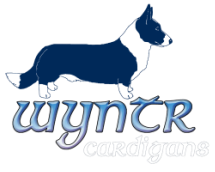 Posting that picture on a website or social media is a great way to show off a cardigan puppy or adult to the world. If that picture is less than ideal, the experience for the viewer can be frustrating or even give a completely wrong impression. Show photos can provide a nice image and many articles have been written on how to get the best results. Unfortunately, even with planning involved, show photos can still tend to vary quite a bit and will not help in photographing puppies too young to attend shows. Taking photographs of entire litters and youngsters as they grow can be valuable tools in a breeding program. They can offer insight on what traits their parents are most likely to produce and reveal how certain traits will develop over time. The two-dimensional nature of photos does limit this to some degree, but a formal photo session offers an opportunity to make hands on evaluations at the same time and take notes for future reference. Like many hobby photographers, I've been trying for years to get that 'perfect' photo of my dogs, sometimes with variable success. As a breeder, I've been taking photos to develop a permanent visual record of my dogs not only for my own use, but as something which other breeders can apply in their own breeding programs in future. With this in mind, I thought I'd share what I've learned over the years through a combination of photography classes, books and lots and lots of trial and error. At least an hour or more of free time to set up and take photographs for a single subject or two. If the subjects are a litter of puppies, allowing for an entire morning and/or afternoon would be ideal. Someplace to photograph which will provide a simple, yet appealing background. One very patient helper who either knows how to operate the camera or stack a dog in a show pose or can at least keep a puppy facing the right direction - or, ideally, both. One grooming table or other similar place for the dog(s) to stand for pictures. One camera with which you and/or your helper have taken a little time to become familiar, so can operate with reasonable accuracy. Lots of film or a good sized memory card for the camera. One tripod for the camera or a second table of similar height to the subject table. If a second table is used, also have some books or a small box to put under the camera so the lens will be about shoulder height to the subject. An expen or crate to use as an easy access holding area if there will be more than one subject such as a litter of puppies. One or more reasonably cooperative cardigans (or other canine subjects). Lots of dog cookies, a squeak toy, a ball or other similar items to help induce an attentive expression in the subjects. Optional: bring a picnic lunch or make plans to go to a restaurant after the photo session is over. Step One: Don't rush. Allow plenty of time for the photo session and take time choosing a spot to set up and photograph. Spontaneous photographs can provide great pictures of course, but taking that extra time can yield much better results when making a formal picture. If you are tense and in a hurry, the dogs will also sense this and may be less cooperative as a result. Step Two: Choose an outdoor setting in which the background is nice, but neutral such as an open field without any buildings, parked cars or other visual distractions in direct view behind the subject or a screen of bushes or hillside which are not too dark. A wall of a nearby building can also work, but be aware of shadows and/or glare if this backdrop is too close or too light. I have also used a lake at a nearby park with some success. Finding the right backdrop is particularly important if the subject has a dark coat color. Check to make sure there aren't any objects in the background which will interfere with the picture. It would not help to have that great looking dog in a perfect pose, but with a tree trunk, a lamp post, part of a parked car or a sign post "growing" out of it's head or back. Lighting. Outdoors usually provides the best light. Indoors often requires supplemental lighting or a flash, which can cause unnatural eye shine, shadows and contrasts. A slightly overcast midday or a clear afternoon later in the day works fairly well. Try to avoid lighting situations which create hard shadows. If it is later in the day, make sure the sun is behind the photographer and that shadows will not be cast on the subject. Step Three: Set up a grooming table or a similar safe platform on which to stand the dog. Make sure it is large enough for the dog to be comfortable, that it is level and will not wobble. In the absence of a grooming table, a picnic table has also worked. Only photograph the dog on the ground if you have a good back and don't mind a lot of stooping and/or kneeling. Don't photograph the dog standing in grass unless you have no other choice. Grass hides the feet and makes it difficult to determine actual leg length, both of which are important cardigan traits which should not be obscured. Step Four: Next, set up the camera. Use a tripod if at all possible. If no tripod is available, try setting the camera up on a second table approximately 6-10 feet (1.5-2 m) away from the first. Adjust the height of the tripod or place the camera on top of some books or a small box on the table so that the camera's viewfinder will be at the dog's mid-shoulder level. Check to make sure the camera is parallel so the photo will not be at any angle to the subject. I usually place a stuffed toy on the subject table where the dog will stand while I adjust camera range, height and focus. Make sure the camera is close enough that the subject will completely fill the camera's viewfinder without being cut off anywhere. It won't do to have the perfect photo of a tiny dog in a large field or tight closeup with no feet, ears or tail. Step Five: If someone else will be taking the photo while you handle the dog, make sure they know how to use the camera and arrange a word or signal to help them time the photo. Many good photos have been missed due to the person behind the camera not knowing how to operate the camera or when is the right moment to click. Be sure to use a word or signal that won't be a cue for the dog to move. Also arrange cues for the photographer to tell the handler if the dog is out of position. Also, make sure the person behind the camera understands that the dog is the primary subject, so the entire table and the handler do NOT need to be in the picture. If they think the camera needs to be moved for any reason, have them hold the dog on the table (not stacked) while you take a look to see what might be off and make adjustments. I can't say how many times I've had my own 'helper', who loves me, decide to include me in the picture. I have plenty of pictures of myself dressed in nice clothing and prepared for a show photo, so I don't need to see myself windblown and wearing my 'grubbies', with mouth open or some other indescribable expression on my face as I'm trying to get a playful puppy or excited adult to cooperate for the camera. This is where having a digital camera comes in handy since photos can easily be reviewed, deleted and re-taken on the spot. Step Six: Position the dog. Look through the camera to make sure the entire dog will be in the picture and is not being cut off anywhere. Double check to make sure the table is level in the view finder. It won't do if the dog is nicely posed, but looks like it is riding the 'high seas' at an odd angle. This is very important and why using a tripod is better than holding the camera for getting a consistent image. When stacking the dog, allowing it to self stack would be ideal. Don't over stack if at all possible (legs stretched way out behind in the rear or leaning too far forward or backward in front). Check to see where collar and leash are positioned. If the dog will stay put without a lead, remove it and place it somewhere nearby and out of sight. Make sure the coat on the neck is not being pulled, flattened, twisted or pushed upward by the collar and if possible, that the collar is hidden by the coat. A very fine chain collar works well in providing control while being hidden or at least partially hidden by the thicker coat on the neck. Once the dog is in place, then only make any minor changes to it's position as needed to correct an out of place foot, etc. Have whoever is handling the dog try to get the dog to look straight forward to offer a complete profile of the head. The angle of the muzzle should be slightly downward, but not so low as to drop the head/neck or too high where the dog is 'cloud watching'. Do not pull the dog's head up, back or forward out of it's natural carriage unless you intend to try and fool viewers into thinking your dog has a better neck, shoulder, topline, drop of chest or prosternum than it has in actuality. This may seem to work, but the truth will often be revealed by a change in the angle of the dog's forelegs, create an unnatural facial expression when the skin of the neck is pulled out of place or the throat is being compressed or even make the dog appear 'ewe' necked or sway backed when it is not. The same can be said for over extending or wide stacking the rear legs in an effort to create the impression of a more level back line, better angulation or more length of body. Again this can often be identified by a change in angle of the front legs and/or the angle of the hocks, it will sometimes stand the dog on it's toes instead of solidly on it's entire foot, can change the apparent angle of the croup and/or tailset and can even make a correct rear appear 'cowhocked' in some cases. And if the dog's legs are stretched way out or if it's head is being pulled out of it's natural position so the dog is unbalanced, it will not be comfortable, is more likely to move before a photo can be taken, and is really not going to make an ideal photo. Some people have used a 'stacking box' to pose their dogs, but often this can result in poor leg positioning or overstacking, which again can give the wrong impression or cause an un-natural pose if the puppy or dog is either not confident on the box and/or does not have good, balanced structure. If the photos are intended to be used for later evaluation, it is also important to get at least a few good natural poses on a normal surface without a stacking box, all feet placed so that the forelegs and hocks are vertical and naturally under the dogs body and hips in order to get an honest view. While posing for the photos, if at all possible, the handler should stand in front or to one side of the dog out of the direct line of the photo. This will highlight the dog, hopefully keep it's attention facing forward and offer a clear view of it's outline without background distractions. If the handler must stand behind the dog or puppy, they should try to be wearing solid color clothing or something that will not be too distracting and blend with the dog's coat color. Keep in mind that if the photo is cropped to only show the dog, only the torso of the person behind the dog will invariably be included, so be aware of what might be showing in the human part of the subject. With puppies, try to spend as little time as possible getting them into position and take the photos quickly before they decide to move. If possible, find an experienced person to help who knows methods for getting wriggly puppies to stand still, at least momentarily, on the table. Doing a little practice with table stacking the puppies for at least a few days in advance of the photo session will be a great help. Puppies who are unsure or inexperienced on the table may require a little more time and patience than the confident wriggly ones. Give them a few moments to adjust to the new experience before trying to stack them. If they crouch, flatten themselves or try to back up when being posed, be patient. Wait a few moments while gently holding their collar to keep them on the table. Often they will relax and stand on their own after a few minutes if given a chance to decide they are safe. Tempt with a few treats or a toy once they are standing and use positive reenforcement to encourage them. If a more dominant or independant puppy decides to 'throw a tantrum' while they are being held on the table, again be patient and wait them out. Once they have settled down, then take them off the table for a short break and try again in a little while. Don't remove them from the table while they are being difficult as this can teach them bad habits. Give each puppy every opportunity to enjoy being on the table. Step Seven: Try to take several pictures in sequence for the best chance at timing that ideal pose. Dogs always seem to know the moment you will be hitting that shutter button, so will be sure to move the second it clicks. Be patient and keep clicking. Better to discard several less than ideal photos to get that great one, than to take just one or two decent photos and miss that perfect shot a few moments later. Have a good supply of favorite treats and/or an exciting new squeak toy on hand as an extra aid in getting an attentive expression. This might seem obvious to most people, but I can say there have been many times when I've forgotten to have one of these things handy for a photo session. Other tricks that might aid in situations where the dog is not interested in food or toys, would be to have the dog's favorite person walk away (with or without another dog) or deliberately go someplace out of sight and then come back while the dog is watching. Make sure they come from a direction that prevents the dog from twisting around to face the wrong way or move out of position. Step Eight Patience is an absolute must! If things aren't going as planned, take a rest break. Don't try to keep making that puppy stand exactly right if it won't or if that adult is camera-wise and refuses to show any enthusiasm. Give them a little play time and try again in a little while or try photographing one of the other subjects instead. Try for some informal photos instead of having them stacked. If the dogs still are not cooperating or things just aren't turning out as well as hoped, be prepared to stop for a while and try again later or even consider just doing it another day. Don't let it become an exercise in frustration or a traumatic experience for a young puppy or dog (or yourself!). Again, try to arrange some practice times before the day of the photo session to make it easier for everyone. Look into clicker training and other motivational handling techniques for ideas on table training your dogs. Keep attitudes positive and avoid unecessary critisism. If the dog was out of position and the photographer didn't notice or the opportunity was missed or the photos just didn't turn out as hoped, then just mark it off as experience and try again later. Step Nine: Take pictures of both sides, front and rear to have a good documentation of structure from all angles. Take a few closeups of the head to get expression. Do not photograph at a three-quarter angle since this can distort some features and may give an incorrect impression of actual structure. A three quarter angle head study can be pretty for a portrait, but if the images are intended for evaluations, take additional photos of the head from the side and front for a better impression of actual proportions. While taking pictures, re-check feet to make sure they are in a good position, head is at a correct, natural angle for a nice profile, the back line isn't slouching or roaching due to uncertainty on the table and look to make sure the tail is not hidden. Finally: Enjoy the time with your dog(s). Make the experience pleasant for them by offering a special treat, taking a short walk before the photo session to burn off excess energy or play a favorite game afterward. Make the experience pleasant for yourself by arranging a picnic in the park or take your assistant to a restaurant after the photo session as a thank-you for their help. Invest in some nice photo editing software or look up some good on-line editing tools to crop and adjust lighting and color of your photos if needed.